The exclusive creation of world-renown designer Neil Poulton, this portable storage solution offers the supreme speed of FireWire 800 along with FireWire 400 and Hi-Speed USB 2.0 interfaces for true universal connectivity. Conveniently bus-powered and plug & play, it’s ideal for backup, video storage and large data volume exchange on the go. Simply plug it into just about any computer anywhere for backup, video storage and large data volume exchange. 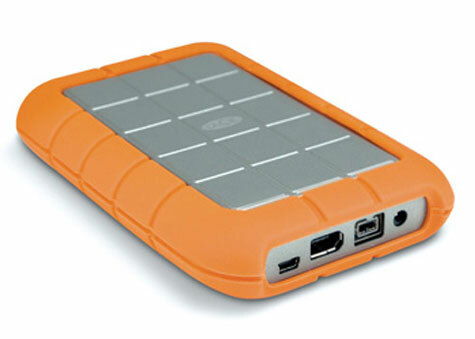 Its unique scratch-protected aluminum shell and shock-resistant rubber bumper make the LaCie Rugged Hard Disk especially resistant to harsh elements for extra protection along the road of your adventures.